Your alarm goes off, you think you are ready to start your day and the very second you set your feet down at the side of your bed there it is again – intense pain starting at the heel and running along the bottom of your foot. Your initial steps may feel like torture and in severe cases it can turn into a nagging pain that lasts all day long. Plantar fasciitis is frequently confused with heel spurs or flat feet. These conditions can be related to PF but they are not identical. Anyone dealing with this kind of pain and discomfort could be suffering from plantar fasciitis. It is estimated that about 1 in 10 Americans, particularly in the 40-60 age bracket, are affected by this common foot ailment. This makes PF one of the most frequently voiced complaints of chronic foot and/or heel pain. Plantar fasciitis is a type of repetitive strain injury that can afflict individuals who spend significant amounts of time hiking, skating, walking or simply standing, both during work or leisure activities. Plantar fasciitis is fairly common among runners, who refer to it as “runner’s heel”. If left untreated, plantar fasciitis can cause additional problems over time with chronic pain or damage to other areas of the body, such as the back, legs or knees. At the bottom of your foot there is a ligament called plantar fascia, which runs the length of the foot and connects the heel bone to the bones right behind your toes. This connective tissue is designed by nature to put some “spring” into your step, but when it becomes somehow irritated, inflamed or begins to show some degeneration this is commonly described as plantar fasciitis. The irritation of the plantar fascia is often caused by overuse and excessive strain on the arch and heel area of the foot. Some of the most frequently referred to culprits for PF are flat feet, bone spurs and overly tight calves. It can become even more complicated because more than one of these culprits can be present simultaneously. The point we are trying to make is that it can be extremely difficult to diagnose and treat ongoing chronic cases of plantar fasciitis. To explore the myriad of possibilities would go far beyond the scope of our blog post. What can You Do to Improve or Heal Plantar Fasciitis? Fortunately for many individuals, their PF heals gradually with some targeted exercises and support measures – usually within 6-9 months. What makes things more challenging is the fact that there is a myriad of support and compression legwear and devices options available. Knowing that plantar fasciitis can be a very complex issue, you will have to expect that one type and size of a therapy or remedy does not fit all cases. There can be frustration along the way in your quest of finding the right support garment or device that promises to bring you sweet relief and hopefully the healing results you desire and deserve. Compression Socks – these are specially designed socks featuring graduated compression zones along the entire length of the foot with a tight fit in the areas that need the most support. Furthermore these elastic socks promote blood flow and boost circulation which also benefits the healing process. 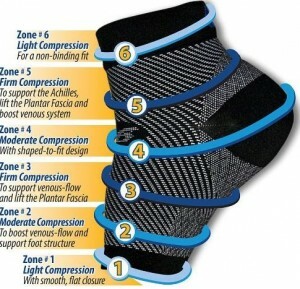 Compression Foot Sleeves – similar to compression socks, foot sleeves also have zones of varying compression extending from the ball of the foot all the way up above the ankle. Foot sleeves can be worn at night instead of a more cumbersome night splint. They are also convenient to wear under normal socks, stockings, tights or pantyhose. Compression Arch Supports – Arch supports are designed with a foam pad to ensure targeted support to the arch. 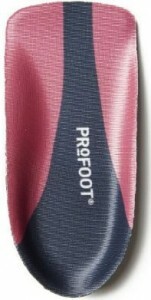 An elastic band that is attached to the pad wraps around the foot to help secure the pad in place. In addition to stabilizing the arch, supports also relieve pain and provide shock absorbing comfort with every step. 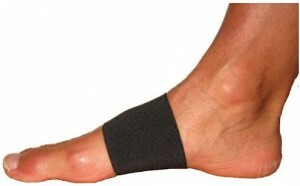 Plantar Fasciitis Arch Wrap or Bandage – An arch bandage applies targeted compression to the arch and makes walking or standing more pleasant. 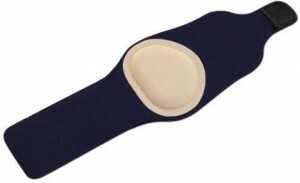 The idea is to provide support to weak, flat or fallen arches and to relieve pain. Bandages can usually be worn any time either over a sock or stocking or directly on the skin. Plantar Fasciitis Insoles and Heel Cup Insoles – Insoles and heel cups are designed to take the pressure off painful heels. They act as shock absorbers and the heel cup also gives the foot more support and stability. Built-in cushioning provides additional protection for the feet. In addition, the PF sufferer can incorporate regular exercises into his or her routine to aid with recovery. Along with the above described measures your physician may also recommend anti-inflammatory medications such as ibuprofen or naproxen.